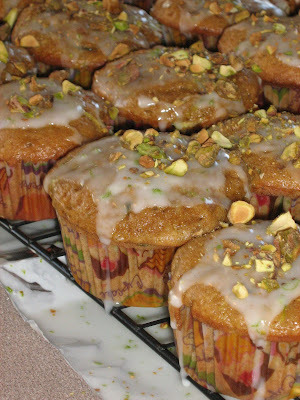 These mini cakes are a doctored-up cake mix. Start with a yellow cake mix and mix according to directions. Fold in 1/2 cup chopped pecans and 1/2 cup toffee bits. Bake in a mini bundt pan that is greased and floured, for 18-23 minutes. Cool on wire rack for 10 minutes; remove from pan and cool completely. In a 1-qt saucepan melt 1/4 cup butter over medium-high heat. Stir in 1/2 cup brown sugar, 2 Tbls corn syrup, 1 Tbls milk, and heat to a rolling boil-stirring frequently. Remove from the heat and immediately whisk in 1 cup powdered sugar and 1 tsp vanilla. 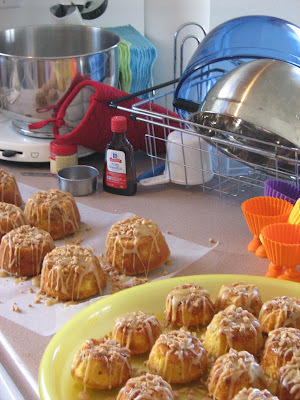 Immediately drizzle over mini cakes and sprinkle with additional toffee bits. I saw these cupcakes a while ago in EveryDay with Racheal Ray and have been wanting to try them ever since. I finally got the chance and they are delicious! Click on the link above and try them. 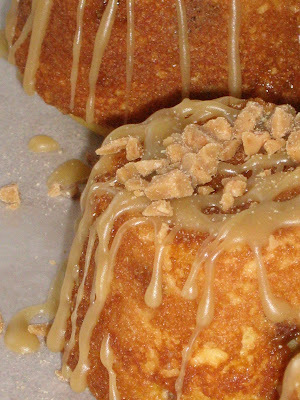 They use a yellow cake as a base and the spices mixed in will drive you wild. My kitchen smelled so good after these got out of the oven! I have to admit of all the cakes, these two look the most tempting to me! I wish I could have some!